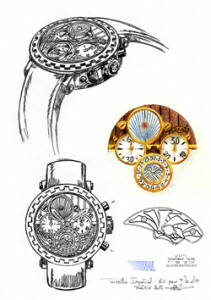 Watchmaker DeWitt presented at the annual international exhibition BaselWorld 2012 watch another new product, in the best traditions of the company – watches Tourbillon Imperial, as noted by the creators of the model – an ode to the beauty of chasodeliya. The original watches are made with a special emphasis on the most noble of all watch complications – chronograph split – one of the most technically complex time functions to illustrate the ingenuity and skill of watchmakers. In the presented model Tourbillon Imperial combined function of time and reference time intervals. Hours indexing time and at the same time make it possible to measure the duration of an event. Watches Tourbillon Imperial is a mechanical movement with manual winding, equipped with a tourbillon and a split-second chronograph, date display and moon phase indication. The balance of the alloy Glucydur – the heart of the mechanism of the original model, which has a frequency balance of 28,000 vibrations per hour (3 Hz) and the Swiss anchor escapement type. Split-second chronograph has two placed one above the other direction to measure periods of time as continuous and intermediate results. He himself is a chronograph design with two columned wheels: the first column wheel operated chronograph when you start, the second – is activated by pressing a button, which is the crown. Clock mechanism is made with a special finish – a coating of “black gold“, and the balance wheel is made of pink gold 5N. Number of Stones – 29, the amount of detail – 342. The body clock round shape with a diameter 44 mm and a total thickness of 14.85 mm is made of pink gold 750th sample. The back cover – Sapphire, on the screws. The distance between the lugs – 21 mm. Dial model – chocolate brown, with a pattern made in the style of DeWitt Cotes de Geneve. Counters are made of natural mother of pearl white, overhead items and rings are made of pink gold 5N. Clocks are made in the form of double-edged sword with a slot, split hand – two thin, elegant hands. Strap watch is made from a natural matte alligator, with triple-folding clasp in rose gold 750th sample, with an engraved monogram «W». Water-resistant watches – 30 meters. Hours are limited edition of 20 copies. You can buy a watch at the end of the exhibition of official representatives of DeWitt.